There’s nothing better than character in a house. Old houses are unique and tell a story, and my goal is to make our new house look anything but new. I think the pantry door and transom accomplish that goal pretty well. I bought the door from the antiques fair in Round Top a few years ago (not the failure of a trip I blogged about, but a previous one) and paid $80 for it. 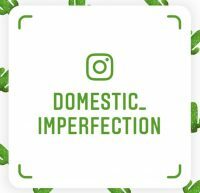 Even though the green on my cabinets and the green on the door don’t match (or maybe because they don’t) it works really well. I like that the door grabs the color from the lower cabinets and brings it up, without it the top half of the kitchen would be pretty bland. The transom above the door was never planned. The framing crew left the pantry door at eight feet because that is how tall the other doors are, but we always intended to bring the level down to the height of whatever door we bought when they came back to do all the patching and touch-ups. But after Adam installed the door we stepped back to try to imagine what it would look like filled with drywall, and he immediately said “It’s going to look stupid and short, all the other doors and windows in the house are 8 foot.” I barely have time to wholeheartedly agree before he said “We should add a transom.” I swear that man gets sexier every day. They came back and were all around the $400 mark, which was WAY more than I wanted to spend. And so, I begrudgingly decided to make it myself. 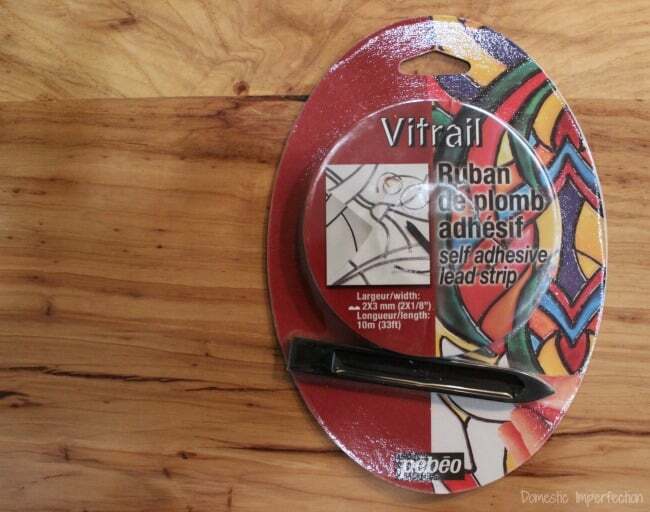 After more internet research than I care to admit I chose to use these lead strips by Pebeo. I was actually excited about this when it arrived because it was a tiny package and super heavy, which means its real lead. I almost cheaped out and bought the paint version, but I’m so glad I didn’t. 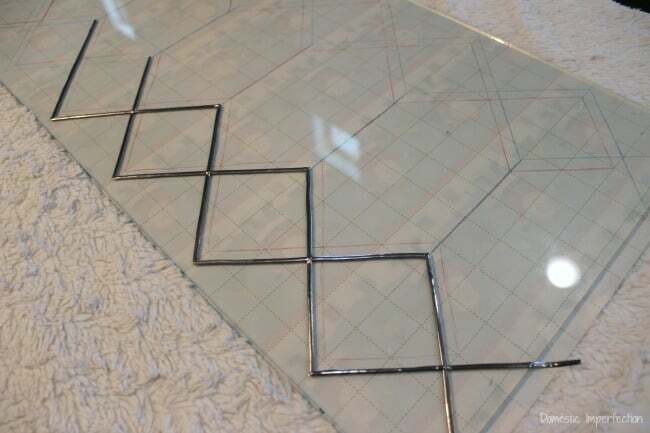 I also ordered a custom cut piece of antique wavy glass to do my design on (I’m serious about wanting stuff to look legit old!) but it arrived completely shattered, so I ended up going to the local glass shop and getting a plain piece for $25. Then I made my design on a piece of paper. 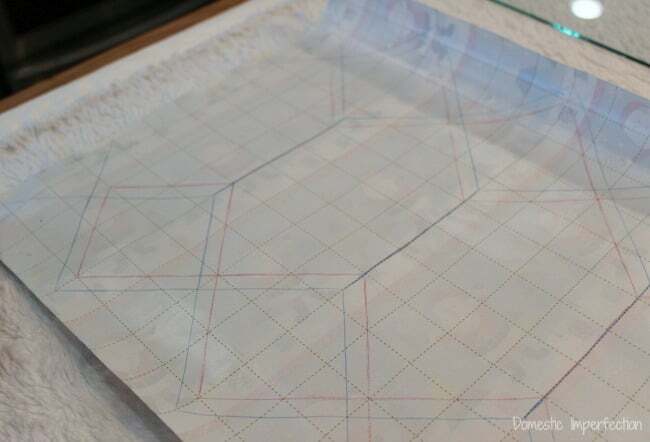 I used the back of some wrapping paper since it had a grid, and obviously getting it just right was a bit of trial and error. After I had it just like I wanted I put the piece of glass on top and started attaching the lead. 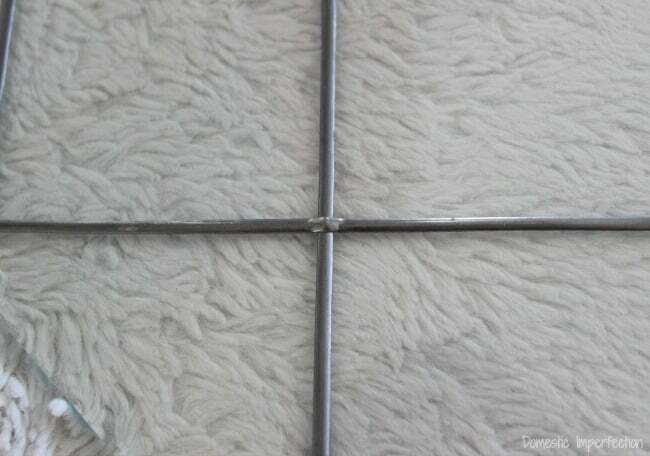 The lead is self adhesive and super easy to use. 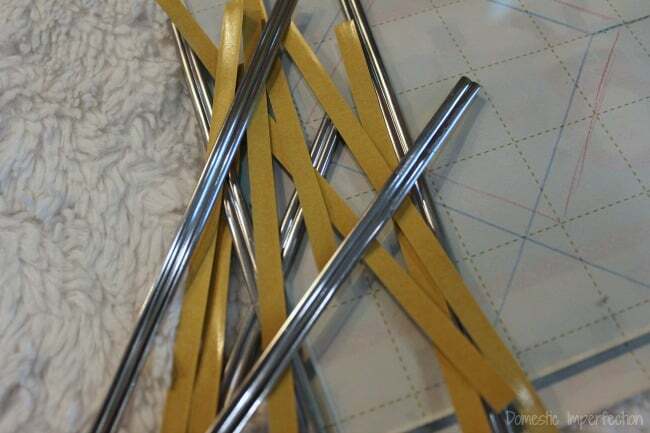 It also comes double thick which I thought was dumb, so I cut my strips in half lengthwise before attaching. This was actually a really fun, easy project that I enjoyed doing (it’s been awhile since I had one of those) and it turned out better than I had hoped. Plus it also only cost about $50 (and I still have a ton of the lead strips leftover). I seriously love it so much, I can’t believe we almost didn’t put a transom up there. Fools. 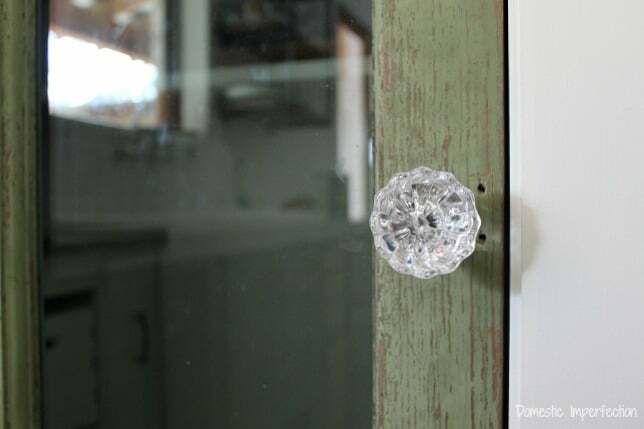 Same story with the doorknob as the transom, wanted a real vintage one and hunted forever, but they were scarce and/or crazy expensive. I ended up taking a chance and ordering this set from Amazon and they sent me two sets (so four knobs) for $8. Eight dollars! 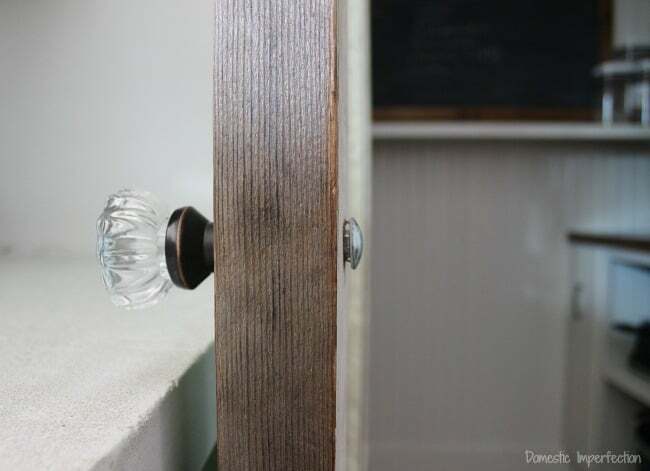 They are supposed to be installed with a knob on either side of the door, but the wood part of our door is so narrow that the interior knob hit the doorframe and kept it from closing. Nothing can be simple y’all, even the easiest projects turn into a whole thing. A trip to Home Depot and some jury-rigging later, we had a solution. 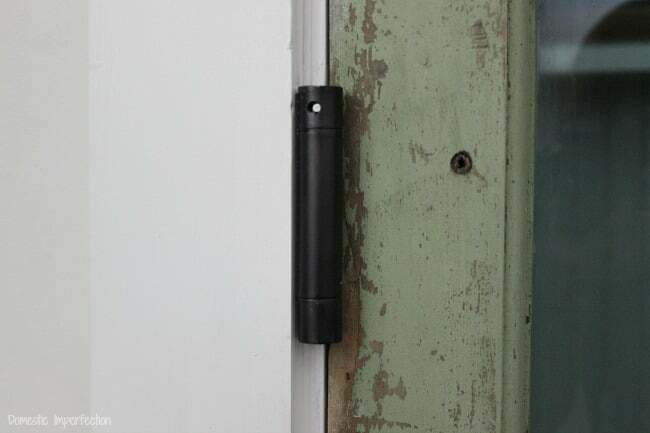 We also added a doorstop and Adam switched out the middle hinge for a self-closing one, which looks just like a regular hinge but a little fatter. It pulls door closed when it’s left open, and the air vacuum created by the door shutting in a small space also keeps it from slamming. 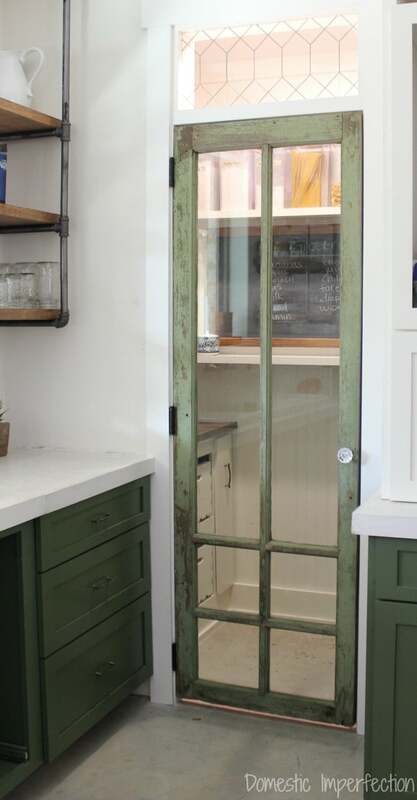 Thank goodness too, because I don’t think an old glass door would last very long with four little boys constantly going in and out and grunting at me for snacks. Here is a quick video clip of it in action (which I totally shot in the wrong orientation, sorry). So that is it, the pantry is wrapped up and 100% complete. If you missed the first parts you can read them here – Part I, Part II. I have no idea what space we are going to complete next. I really want to do our master bedroom and have a finished place to relax a the end of the day, but we also have to do a ton of work outside before it gets too hot, and we need to keep chipping away at the kitchen and wrap that up. We will probably end up working on all three at once you will get a mish-mash of blogs posts for the next long while. 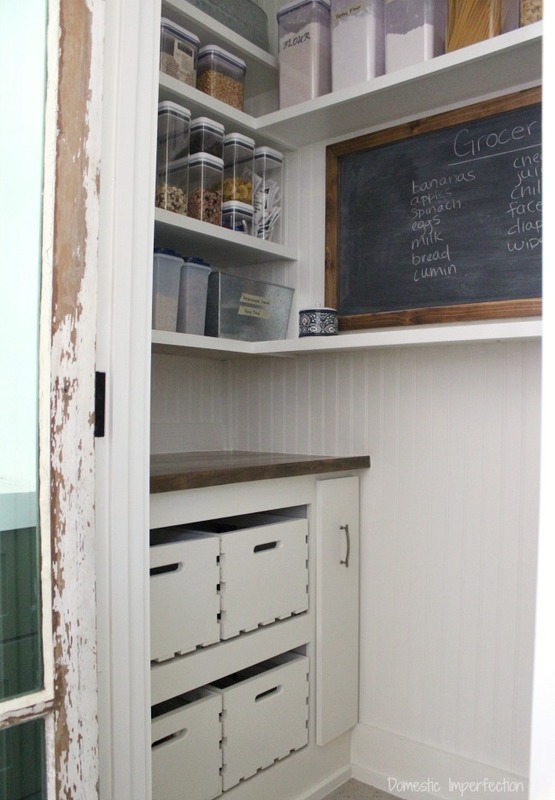 What a fantastic job the two of you did on the pantry. 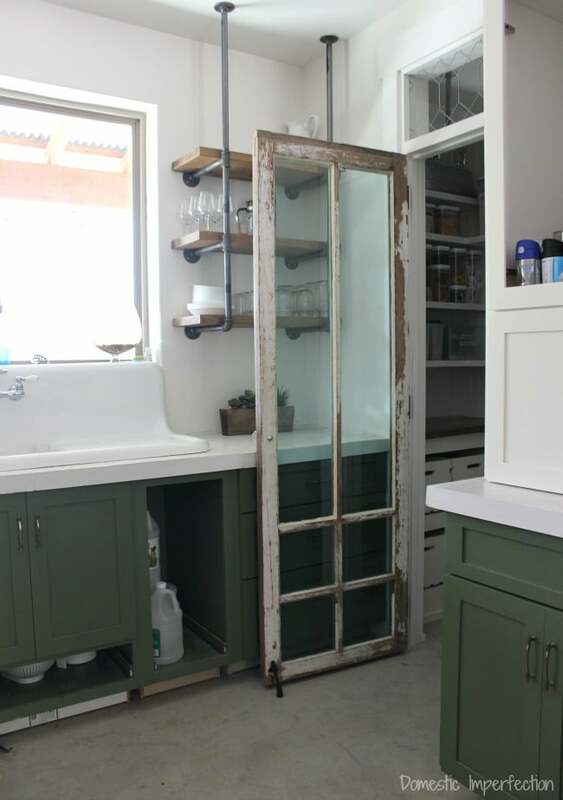 The finish on the door is a perfect color complement to the cabinet color. And the transom is just inspired! And your two little ones in the video! Just priceless. I know what you mean about your husband getting sexier all the time….I feel the same way about my guy when he comes up with a brilliant DIY plan (and we’ve been married over 40 years!) 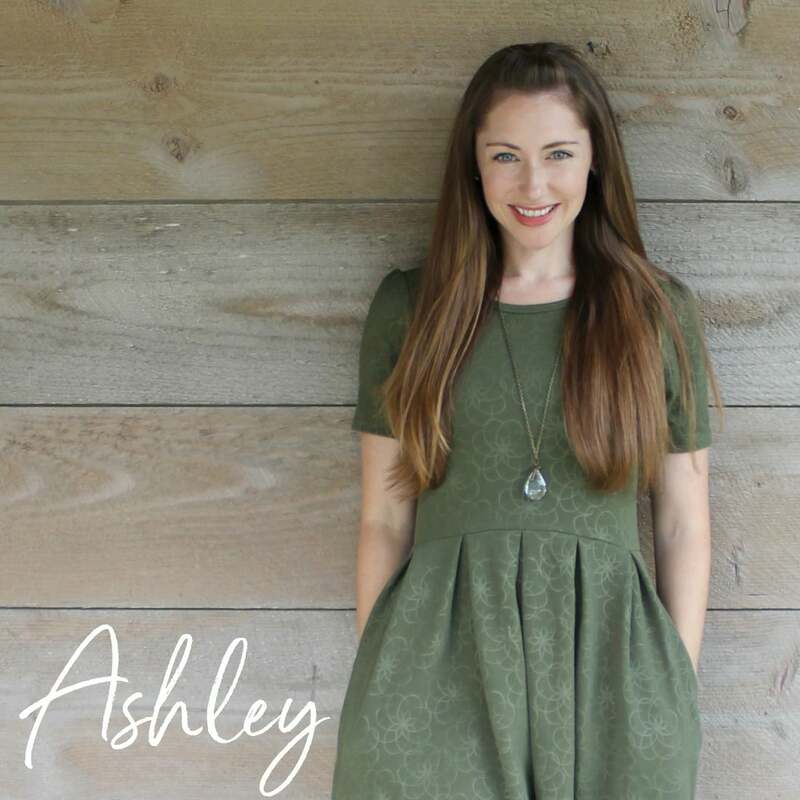 I love your blog and the relaxed “keeping it real” vibe. I steal ideas from you fairly often! All of your projects are phenomenal. But this … THIS! Job well done! I had never seen the adhesive lead before! I love the look! So beautiful! 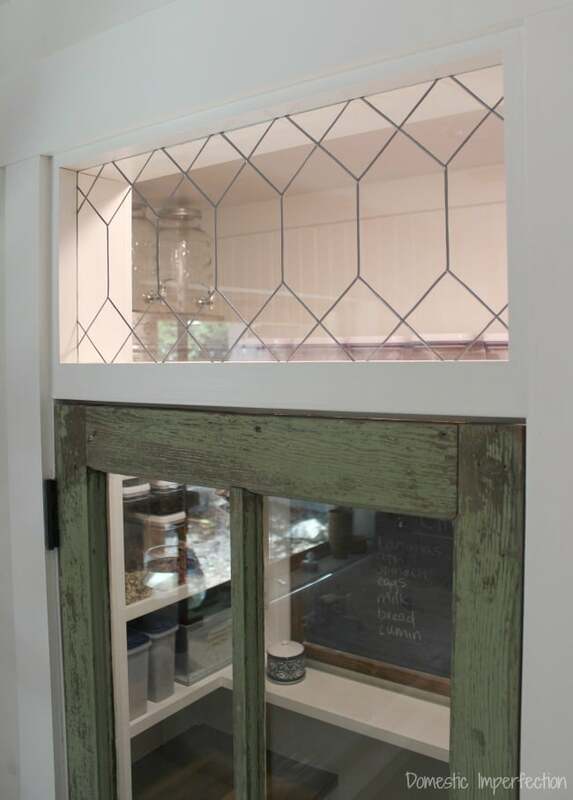 And that transom is just gorgeous… Even better because you made it yourself! Beautiful door! And great job on the transom. I agree, the door colour works perfectly. This is so great…it looks amazing! But my favorite part of the post was that mischievous “ok now we both try to SLAM it”. :) What cuties. I love your transom. That’s a great way to let light in, too! Thank you for sharing! 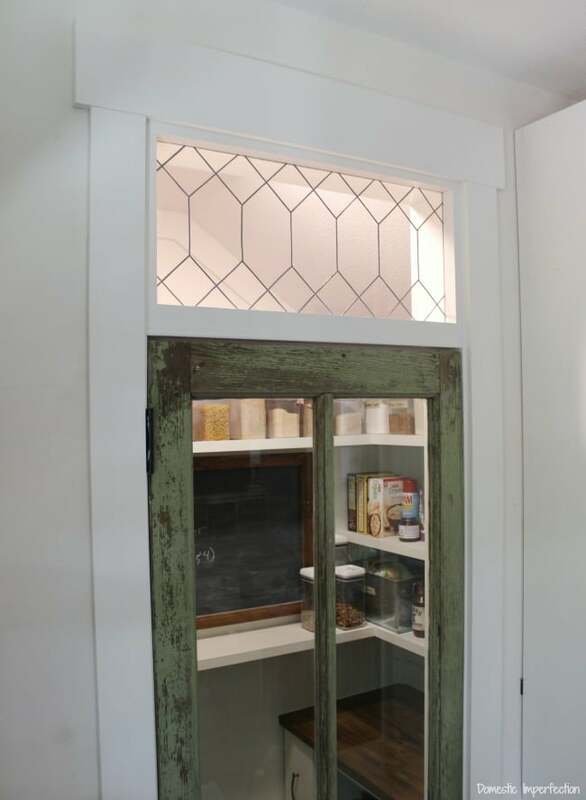 That leaded transom DIY is one of the coolest things I have ever seen!! 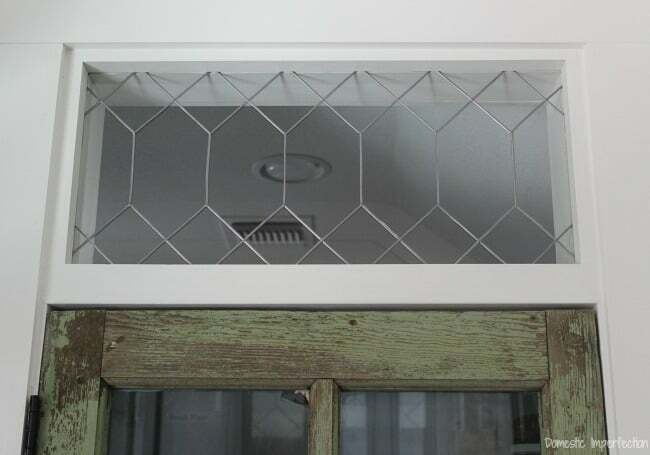 I was once in need of a a transom in a remodel, I used a leaded glass entry door side light from the ReStore. Turned it horizontally above the doorway! Turned out to be the focal point of the room. Wish I had blogged all that! This is beautiful! How does it look from the other side? 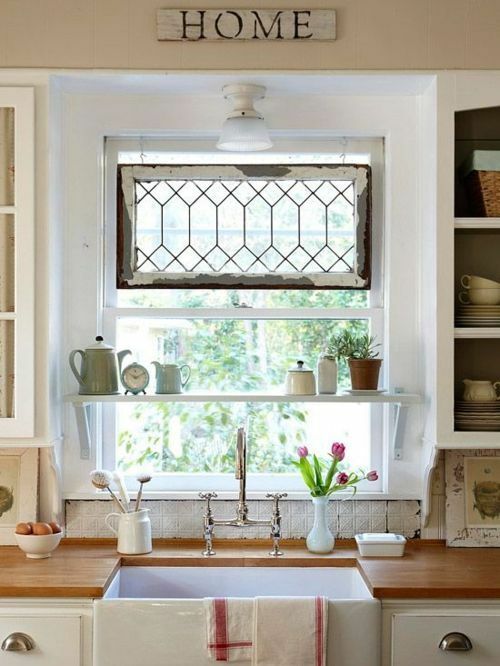 Would this work on a regular window and look pretty from outside of the house? Thank you! It looks good from the other side…not quite as pretty as the front, but from any distance at all you would never know the difference. Love this. I read it a while ago and now am ready to tackle the same project. Two questions: did you lead both sides of the window? And if not could you? 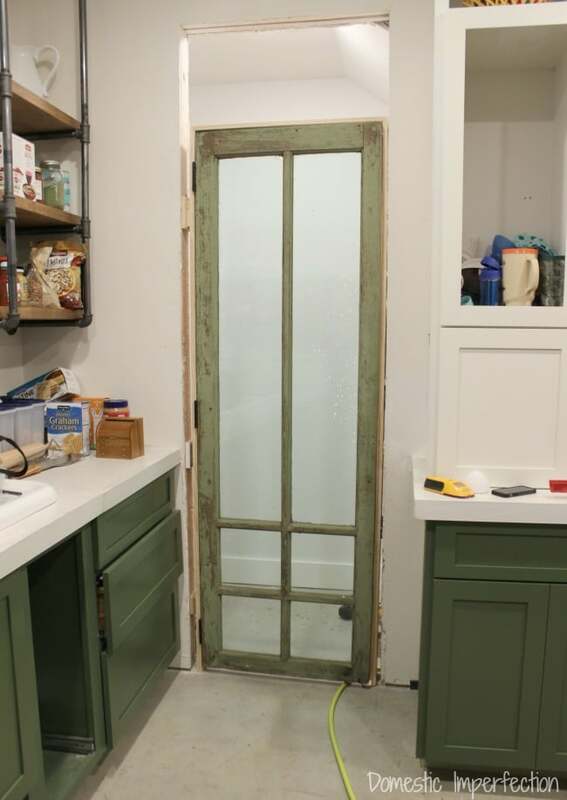 And did you build a frame with wood trim for the glass in order to install it? Ok sorry that was more than two questions.